11 tracks: Bringing Buddy Home * Standing In The Light * Nothing Worth Saving * Snowdrop * The Dreamer * Flying Away * Canadian Christmas Song * Someone Else’s Problem * Lost Soul * An Australian Prayer for Rain * The Last Note. 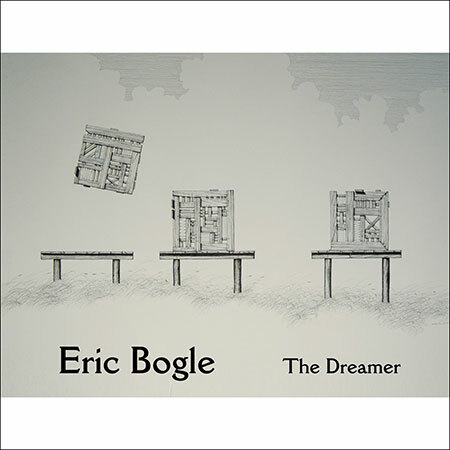 The Dreamer is Eric Bogle’s 15th album and is released as Eric prepares to hang up his ‘touring boots’ and embark on a final UK tour. As always, Eric will be accompanied by his long-time buddy John Munro, who has produced this and other Eric Bogle albums. Some of his other songs - No Man’s Land (The Green Fields of France), Leaving Nancy, Now I’m Easy, Shelter, If Wishes Were Fishes - are now beginning to rival Matilda in the icon stakes. Eric’s songs have been recorded by Joan Baez, Mary Black, Jean Redpath, June Tabor, Donovan, John Williamson, Billy Bragg, The Pogues, The Fureys and The Corries - to name just a few. Eric was born in Peebles in Scotland and says he was ‘destined to be a politician or a folk singer of protest songs… And so one of these prophecies came to pass…’ In 1969 he emigrated to Australia and in 1980, after various jobs, he embarked on the perilous career path of a professional musician. This is yet another fine clutch of songs from Eric, plus one by John Munro. The songs are thought- provoking as always and bound to move the listener. With John Munro (acoustic guitars, mandolin, banjo, vocals), Emma Luker (fiddle, cello, backing vocals), Phil Cuneen (piano), Pete Titchener (acoustic guitar), Trev Warner (dobro) and Damien Steele-Scott (electric bass) providing excellent backing. Bringing Buddy Home deals with coffins of young American soldiers being shipped home from Iraq. Nothing Worth Saving is for those willing to stand up and be counted for what they believe in. The Dreamer - Eric says ‘I admit it, I’ll hold up my hand’. Someone Else’s Problem is about the great Murray River slowly dying. Lost Soul deals with the disgrace of the Australian Ngarrindjeri people not being regarded as Australian citizens in 1916, and John Munro’s excellent contribution Snowdrop is a song about homelessness. The last song on the album is aptly titled The Last Note, and Eric states simply in the sleeve note - ‘Indeed it is’.